This project is focused on developing a hardware in the loop (HIL) testing architecture for vehicle-to-infrastructure (V2I) and vehicle-to-vehicle (V2V) applications. The selected case study for each HIL architecture is signalized intersection approach and departure (SIAD) and cooperative adaptive cruise control (CACC), respectively. The Federal Highway Administration (FHWA) continues to be a leader in the research and development of connected and automated vehicle (CAV) applications, which have the potential to offer significant benefits in the areas of mobility and safety. One of the major challenges in testing and demonstrating the benefits of these technologies is the exorbitant cost of large-scale, multivehicle demonstrations. This has resulted in a lack of robust CAV field data for the development of valid CAV modeling tools for State and local transportation agencies. One way to overcome these challenges is to use emerging HIL tools that enable physical vehicles to interact with virtual vehicles from traffic simulation models. This provides an environment that can replicate deployment conditions without incurring the prohibitive cost of multiple advanced vehicles. Developing the first of its kind comprehensive HIL testing architecture capable of integrating a connected automated driving system as hardware into simulation software. Implementing HIL architecture at a selected CAV testbed: the Cooperative Vehicle-Highway Testbed located at the Turner-Fairbank Highway Research Center. Assessing impacts of V2V and V2I applications—specifically SIAD and CACC—using HIL architecture. Developing vehicle control algorithms and calibrated microsimulation models to accurately emulate CAV hardware and performance based on HIL tests and subsequent analysis. FHWA developed the V2I-based HIL platform in mid-2017. The research team is developing a V2V-based HIL system and will be conducting HIL testing of CACC in 2018. A microsimulation software generates virtual background traffic. This traffic is synchronized with the physical CAV and traffic controller through the broadcast of basic safety messages (BSMs) and detector data at a frequency of 10 hertz. Considering both virtual vehicle detector data and the physical sensor data, the controller generates corresponding phase status data and sends it to the microsimulation software. This allows the synchronization of the virtual signal controllers phase status with the physical traffic signal controller in real-time. In parallel efforts, the virtual vehicle BSMs and the signal phase and timing (SPaT) and map messages from the physical traffic controller are transmitted to the onboard unit of the physical vehicle. The physical vehicle is synchronized into the microsimulation software by sending the location of the physical vehicle to the HIL interface via Ethernet. The queue-aware SIAD application is implemented via the onboard computer of the physical vehicle. The necessary real-time inputs for the application are obtained from in-vehicle data, data broadcasted by roadside units, and other virtual vehicle data sent from the microsimulation software through dedicated short-range communication (DSRC). Figure 1. The V2I-based HIL platform. The green box indicates hardware components. The orange box indicates software components. The dashed and solid lines indicate DRSC and Ethernet communication. If the physical vehicle does not detect a vehicle impeding its path, follow SIAD trajectory. If vehicles are detected, use the connected vehicle (CV) data to estimate the current queue length at the downstream intersection. Q-SIAD algorithm optimizes trajectory to new “virtual stop bar,” defined as a specified distance upstream of the last detected vehicle in queue. HIL testing of SIAD was completed in September 2017. The background traffic density, CV market penetration, Q-SIAD scenario, and the initialization time within the traffic signal cycle were used as explanatory variables to describe the performance of the Q-SIAD algorithm. As expected, researchers found that background traffic and the availability of connectivity both have a strong impact on the benefits of the Q-SIAD application. This further illustrates the importance of larger scale testing of applications to inform the forecasted benefits of increased connectivity and automation. More detailed results will soon be available in a forthcoming article in the Transportation Research Record. A technical report detailing the research effort for developing the HIL testing architecture for both V2I and V2V applications will be available in early 2019. Ma et al. (2017). 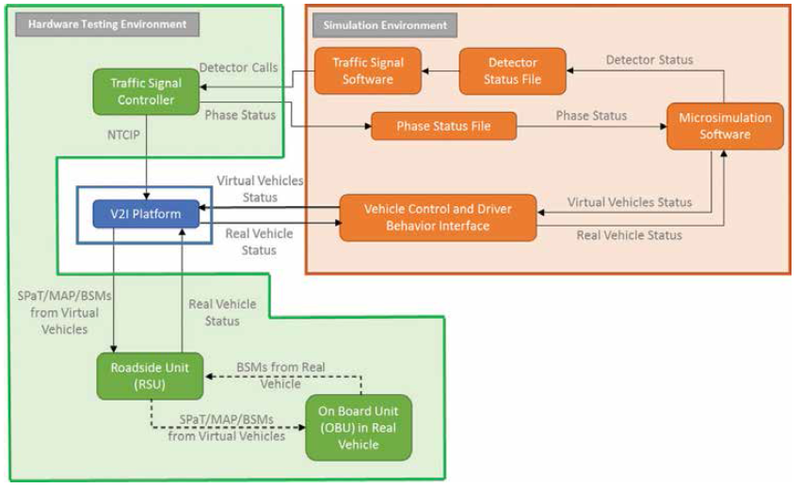 “Hardware-in-the-Loop Testing of Connected and Automated Vehicle Applications: A Use Case for Queue-Aware Signalized Intersection Approach and Departure.” Submitted to the January 2018 TRB.